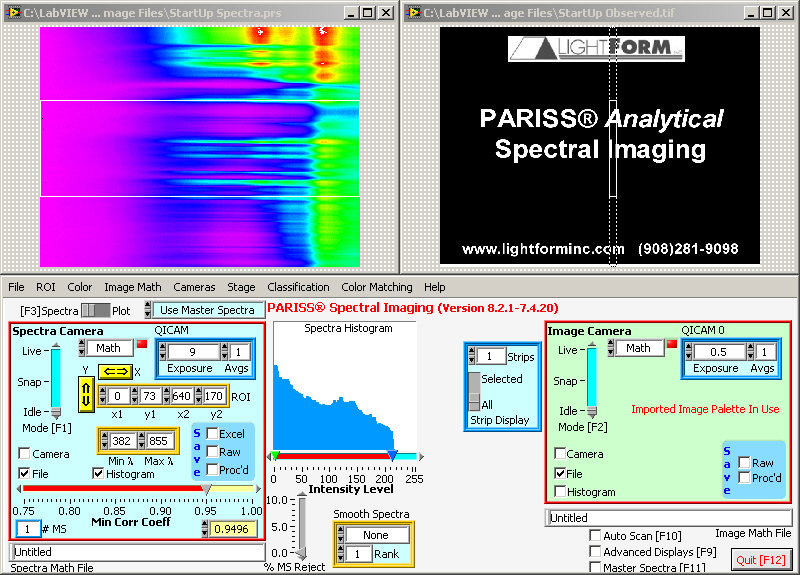 HOME: Industry Solutions » Instrument Development » Lightform, Inc.
LightForm, Inc. http://www.lightforminc.com/ markets a spectral imaging system (under the trade name of PARISS) for use in image segmentation, differentiation, identification and quantification. A sample is typically imaged through a microscope or other optical instrument. It contains two CCD cameras which are coupled to a Windows machine through a IEEE-1394 interface. One camera displays an image that the user would normally observe through the instrument eyepiece (Observed Image) while the other displays a spectrally derived image (Hyperspectral Image), derived from a segment of the Observed Image. Control of camera functions (e.g. gain, contrast, exposure time and picture acquisition). Spectral classification based on cross correlation to aid in identifying sample content. 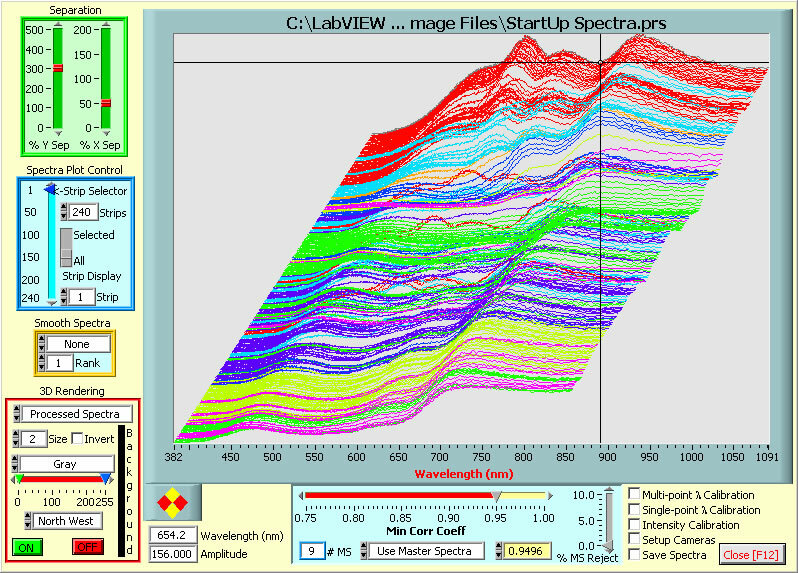 Reduction of the spectral image to a series of intensity plots versus wavelength for use in evaluating sample content. 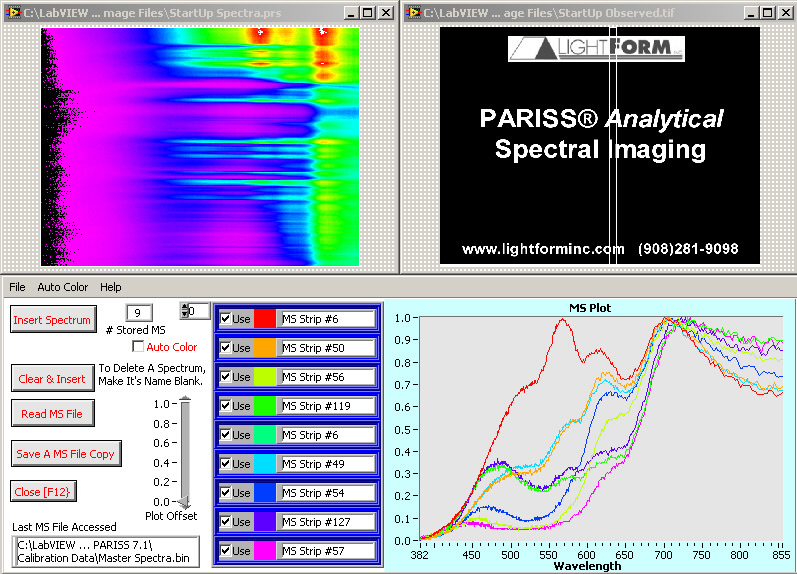 Low pass filtering of spectral intensity plots to improve the signal-to-noise ratio. Image display using false color image enhancement. • Basic image arithmetic functions such as addition, subtraction, division and multiplication. Save raw and mathematically manipulated images to files. 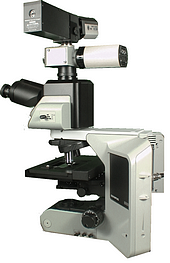 Automatic scanning of the microscope slide holder (stage) to automate image data collection. The entire instrument including a translation stage, cameras and sophisticated data processing were integrated by Process Automation Corporation via LabVIEW and its IMAQ imaging extension.